It’s happening again. Oregon fans are getting absolutely sick of hearing roster news midweek this season, especially this week, but here it comes. Again. According to CSNNW’s Aaron Fentress, another Duck has taken a dive, and this one has no one to blame but himself. 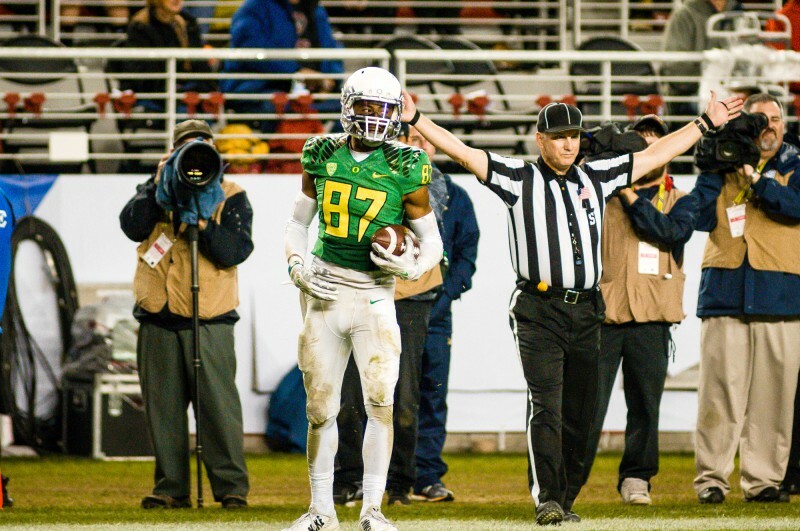 Darren Carrington, perhaps Oregon’s best, and certainly its hottest wide receiver, has tested positive for marijuana and been found ineligible for Monday’s game. The decision came directly from the NCAA, not from the University of Oregon and the school has already appealed the decision, and lost. 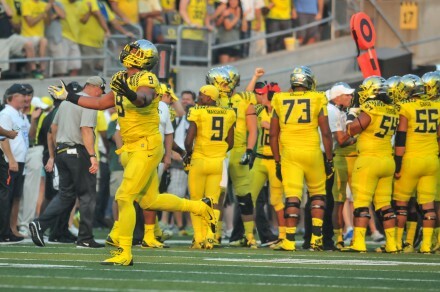 Carrington is just the latest of a slew of QB Marcus Mariota‘s favorite targets to drop off the depth chart, joining special team’s dagger Bralon Addison, All-American tight end Pharaoh Brown and, most recently, freshman wideout Devon Allen. Carrington had followed a breakout performance against Arizona, in which he caught seven passes for a 126 yards, with a career day in Pasadena, where he pulled in another seven, this time for 165 yards and two scores. Carrington has been an enormous part of the Duck offense, ranking fourth on the team with 37 receptions this year, 27 of which went for first downs or touchdowns. The red-shirt freshman also represented Ohio State’s scariest deep threat, averaging almost 20 yards per reception and totaling over 700 on the year, despite not catching a pass against UCLA or Utah. This loss added another formidable figure to what is becoming college football’s most star-studded bench: Addison, Brown, Allen, and DB Ifo Ekpre-Olomu. All year, however, the Ducks have preached, and practiced, the next-man-up philosophy, plugging their unusually common game-day roster openings with fresh faces nearly every week and marching bravely on. This team has shown an extraordinary resilience in the face of unexpected losses, and while it’s not exactly offensive coordinator Scott Frost’s style to rebuild a game plan around a roster slot, Mariota will still have options between now-healthy senior leader Keanon Lowe and scatback/wideout-hybrid Byron Marshall. All in all, while the news certainly hasn’t been kind to Oregon fans lately, we can expect Mariota and the Monday night Ducks to stay frosty.